I am in the middle of a three day juice cleanse right now and feeling absolutely miserable. Why must I always torture myself in the most unpleasant of ways? To be fair, I've only done three juice cleanses in my life and after they are over I always think to myself, "Hm, that wasn't so bad". Then about 8 months later I seem to forget how miserable I felt during the cleanse and decide to do another one. Well, now it's here in writing - my misery - so hopefully this serves as a constant reminder why I should never do another one. And of course, this week I seem to be thinking about pizza more than I've ever thought about it before. Due to the juice cleanse, this week has been less than spectacular, although I did get to attend a fabulous book launch party the other night for a book I worked on at my job. There was tiny food (I did get to enjoy as this was pre-cleanse), individual mini bottles of champagne with gold straws, a photo booth, custom Essie nail polish, cotton candy - you name it! It was fun to get away from the office for a bit and disappear into a wonderland of glitter and confetti. This weekend I'm looking forward to no longer being on my juice cleanse. Hopefully Pat and I can go eat somewhere really fun, that involves a lot of fried food and burgers. Have a great weekend! 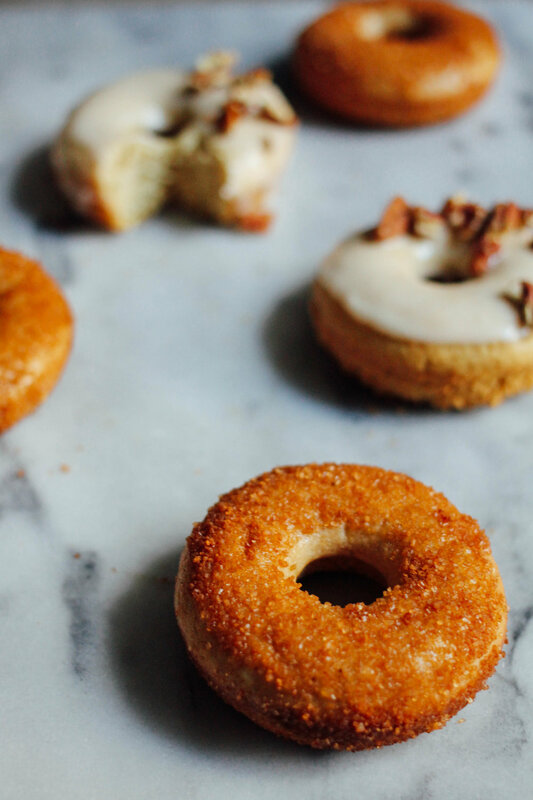 Ok so admittedly, being on a juice cleanse and doing a post about donuts isn't really helping my hunger pangs right now, but I do love a good donut! I decided to bust out my donut pan last weekend and make not one, but two, varieties of fall donuts - apple spice and maple pecan. I couldn't decide which was my favorite, so you'll have to try and let me know! In a large bowl, mix together all dry ingredients for the batter base. In another medium bowl, mix together wet ingredients, and add them into the dry ingredients, stirring until evenly mixed. Separate the batter into two bowls. In one half of the batter, add in the rest of the ingredients for the apple spice. In the other half, add in the rest of the ingredients for the maple donuts. Use a piping bag to pipe the batter into the donut pans, filling each cavity halfway. You'll have to do this in two batches, one for each flavor. Bake for 12 minutes, or until a toothpick inserted into a donut comes out clean. Cool in the pan for 5 minutes. Remove donuts carefully to a baking rack and cool completely. Apple spice: Brush donuts with water/confectioners sugar glaze, and then roll donuts in cinnamon-sugar mixture. Maple Pecan: Dip donuts facedown into maple glaze, and let excess drip off. Garnish with chopped pecans. Topping: 1/2 turbinado sugar mixed with cinnamon, and 2 tablespoons of confectioners sugar mixed with a couple water drops.